MACH Acoustics have experience of working with a number of constructions, from standard off the shelf lightweight metal stud walls to unusual timber cassette panels to bespoke ideas as part of a decorative effect. Whether it be a new build residential block or a Grade II refurbished building fitted for offices or teaching, MACH always take a detailed design approach to ensure a high level of acoustic performance, whilst achieving a cost effective and carbon neutral design. 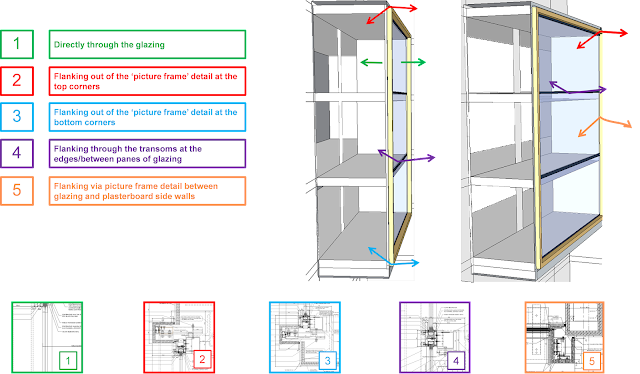 MACH Acoustics were asked to investigate the level of sound insulation that would be achieved from the introduction of new glazed breakout ‘pods’ and the adjacent atrium at Lacon House in London. The interest laid in the feature design ‘picture frame’, a timber lining around the external glazed walls of each pod. Despite the open feel of these pods, the task was to ensure that noise within the atrium would not be a disturbance in the acoustically sensitive pods used as meeting rooms. MACH applies a structured approach to these kinds of problems, realising that sound transfer not only comes through the wall or glazing, but also from flanking through junctions with adjacent elements, in this case the feature design picture frame. Simply upgrading the construction of the glazing does not work when the flanking performance is poor, hence by looking at the bigger picture MACH are able to avoid over expensive designs that don’t work and focus on cheaper, high performing solutions through clever considered engineering. In this case, MACH componentised each possible transmission path to consider the sound reduction through each, zeroing in on the areas that had the most influence on the overall sound insulation. We used our extensive collection of manufacturer test data, on site test data and modelled performances to accurately calculate this. This approach allowed MACH to tweak details around the frame and glazing until a high level of performance was achieved, keeping the thickness and expense of the glazing to a minimum and achieving an aesthetically pleasing design.